Fashion Anna: How to analyse a fashion show on trends? 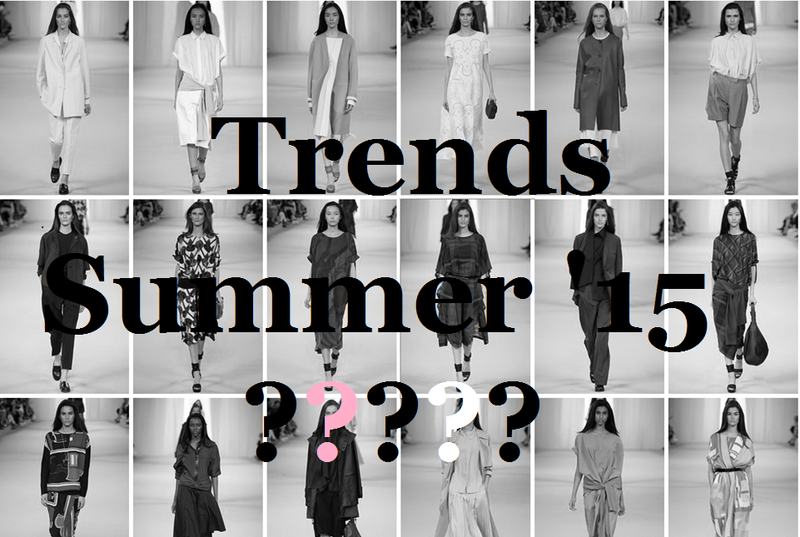 To be fully reliable in your trend reporting, you will need to analyze multiple fashion shows. However, for starters it might be more useful to analyze a single show since it forces you to use your imagination and think bigger. Today I will be showing you how you can discover new trends yourself. How cool will it be if you could predict next years fashion trends? Of course it requires practice and a little bit of feeling, but in this post I will try to get the main points of a fashion show trend analysis straight. For this post I´m using the Hermes Spring/Summer 2015 show as presented on Vogue UK. One of the most easy things you can do, is analyzing the color(s) in the collection. If you can´t immediately see what colors are returning the most, just make a list of colors per outfit in, for example, Excel. Then count which colors are returning the most. Yup, it´s that easy! In this collection the returning colors are white, dark blue and brown. What fabrics and materials are used the most? If you can not see it immediately you can again decide to create an Excel sheet. In the Hermes collection a lot of thin, light weight, blouse-like materials are used. The cardigans and coats, however, are made out of a more shiny, almost raincoat material. If a collection consists of rich evening dresses as well as summer shorts, it might be hard to analyze them as if they are one. That´s why we want to make sure the clothes are meant to be for day or night. The clothes in the Hermes collection are not specifically for a chic night dinner, it are chic day time clothes. I can see this because the clothes are loose fitted and casual cardigans are knotted around the waist. In this part you might want to think about the kind of garmends in the collection, like jackets, skirts or pants. Also you must wonder if the skirts (for example) are high waisted, short, long, or maybe even rolled. Are there many straight, diagonal or other kinds of cuts? In the Hermes collection are many coats which differ in length. However there are also some kimonos or cardigans knotted around the waist. Many skirts and culottes are at the length of the tibial. The clothes are loose fitted with an accent on the waistline. This might be the hardest of all because you will need to know something about the world and fashion history. Think about occasions or any inspirations the designer might have had. This Hermes collection might have been inspired on the desert. It seems as if the summer clothes are made out of a light material, they are loose fitted and the khaki colors are often worn in desert areas. The darker clothes might be for the evening when the sun goes down and it gets colder. If you are analyzing multiple collections or shows it´s smart to think about possible inspirations. If they overlap you might just have discovered a huge trend directions. But even if you are just analyzing a single collection it´s nice to know what you are looking for. It makes it easier for the other analysis parts as well. The more you know, the more you can think of and suddenly all the different parts of your analysis fall together. It might be nice to include the hair in your analysis since you will be creating a look in the end. Also it really tells something about the outfits the models are wearing and the possible events that go with it. In this show the hair is basically straight, a little bit volumized, with a hair separation on the left hand side of the head and behind the shoulders. Since we are mainly talking about the garments in this analysis, the accessories are not totally involved. However, they might be worth analyzing as well. Look at the first 5 steps of this analysis and use them just for accessories. In this collection are mainly black heels with straps around the feet and ankles. Also almost all the shoes have an open toe. There are just a few small black and bright red bags. Some models wear a small silver bracelet. 7. Create a typical ´collection´ look. Of course we can not forget to use our skills and analysis in real life. Draw, cut and paste or photoshop one or more looks which are typical for the collection you just analyzed. Keep in mind if it´s a day or night style. If you are analyzing multiple collections at once, I´d recommend to create at least 3 of these since they might differ a lot and other ways the looks will not be representable enough. Personally I love this part since you can be very creative and use your analysis! Did you ever try to analyze a fashion collection or show? Tell us in the comments! I think it is great to look at a collection and really get to the root of it!